Casa Dos Hermanos, at Playa Las Tortugas. A vacation to remember! Escape the hustle and bustle of the everyday, move beyond the crowded beaches of Puerto Vallarta and Sayulita, drive North, hit the beach, breathe. 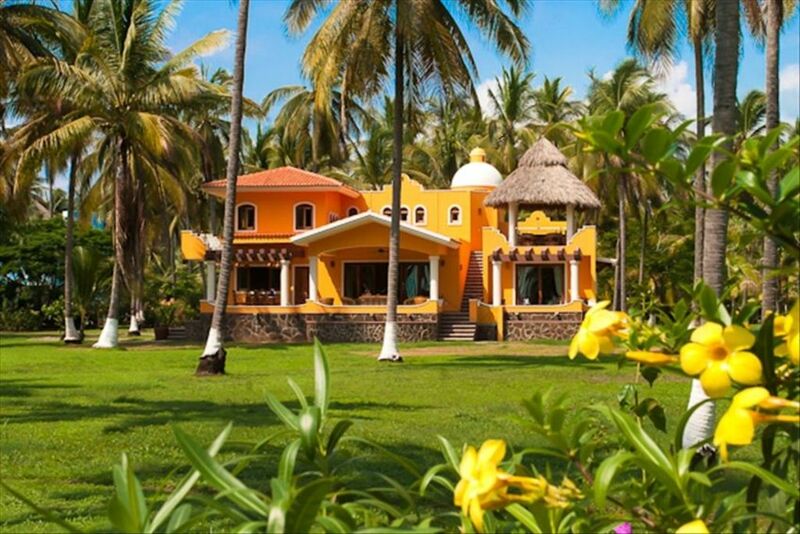 Casa Dos Hermanos is the newest addition to the secluded resort community of Playa Las Tortugas. At the end of a 5 mile stretch of deserted beach and abandonded palms lies a true escape. Come for the beach, for the surfing, come for the birds, the turtles or the whales, come for the seclusion or the adventure, or maybe just come for the hammock and the margarita, the sunsets, the quiet. Leave satisfied, happy, refreshed. Our 3 bedroom house comes fully stocked and equipped with all the space and amenities necessary for you to enjoy a wonderful trip. Whether you're after a couples getaway or a full family retreat we're happy to accommodate your every wish. Bedrooms: *3 Bedrooms, Sleeps 8 *Downstairs Master Suite - 1 King *Upstairs Master Suite - 1 King, 1 Baby Crib *Downstairs Bedroom - 1 Queen *The house has 2 master suites complete with bathroom. One is located on the main floor with direct access to main front awning. The second master suite is upstairs with access to two porches. 3 Bathrooms: *Master Suite Downstairs - Toilet, Shower *Master Suite Upstairs - Toilet, Shower *Downstairs - Toilet, Shower *Outdoor Shower - Outdoor Shower, Shower Only * All 3 bathrooms in the casa are full with sink toilet and shower. The bathrooms in the master suite each have an additional sink. Additionally an outdoor shower is provided. If you have any specific needs or questions please don't hesitate to ask. We can likely accommodate just about anything you're after. Can't wait to return to this hidden gem! Wonderful time was had by all. Eli was fantastic to work with during the booking process. Onsite staff was amazing as well. If you want to feel like you found paradise this is the place to go! Secluded beach, palm trees for as far as they eye can see, mountains beyond that and you might even find yourself caught up in a cattle drive heading down the dirt road to this destination! The house, the beach, the location was everything we were looking for! Bella took great care of us, the food was just awesome. The staff couldn't have been nicer. It's out of the way and you have to plan ahead for food and drink, but well worth the effort if you prefer to stay away from the nightlife and really unplug. The owners are more than happy to answer any questions to help you arrive prepared and ready to relax. We will be back! The only thing I would change about our trip... We had Playa Las Tortugas arrange horseback riding for 4, which we will skip next time. We are horse people and two of our horses lied down on the beach with riders on their back... one got loose and took off. Wasn't the safest ride, especially with kids. We'll pass along your kinds words to Bella and the staff. Thanks again for going with us, we greatly appreciate it and will look forward to catching up again in the future. You're more than welcome back any time! We LOVE Playa Las Tortugas!!! Casa Dos Hermanos was stunning!!! Everything about our trip was wonderful - from my first interactions with Eli over email, to our daily interactions with Bella onsite! Eli was accommodating, friendly and always responded quickly via email. Pascual was our onsite go-to man and he was super helpful, friendly and an absolute pleasure to deal with. Bella was amazing, her cooking was out of this world and she was so lovely to our daughter and all of us. We truly felt spoiled and our expectations were blown out of the water! Between the three of them, I have never had a better experience in setting up/organizing a vacation stay. The home is BEAUTIFUL, so well cared for and its truly a vacation paradise. We will definitely be back and we have already recommended Casa Dos Hermanos to 5 other friends of ours. I cannot say enough good things about this place - Eli, Pascual, Bella, the stunning home and the picturesque tropical landscape made this vacation a 10 out of 10! Thank you so much Rodney! Had a wonderful 3 days at this resort in a beautiful home called Dos Hermanos. The staff were incredibly attentive and went out of their way to provide excellent service. There is plenty of room in the home that has a beautiful view of the ocean and you can listen to the sound of the surf at night. Bella cooked us a great meal. We swam over the estuary one day to eat lunch in the small neighboring town of Platanitos. We highly recommend you visit if you are looking for a quiet, relaxing beautiful environment. You will definitely find it there. My husband and 20 year old daughter just returned from a wonderfully relaxing time at Playa Los Tortugas. Dos Hermanos is tastefully decorated with cheery colors throughout and very spacious. The staff were wonderful, professional and very attentive to our needs. We had a few meals cooked for us by Bella and they were delicious. The grounds are immaculate and the beach is deserted with no rocks. The water was warm making any kind of water activity very pleasant. If you are looking for a place to unwind, you will find it here. Thanks so much for your kind review Pat. You guys are welcome back anytime!